A tempting outdoor swimming pool lies looking over the white powdery sand beach and emerald blue ocean. 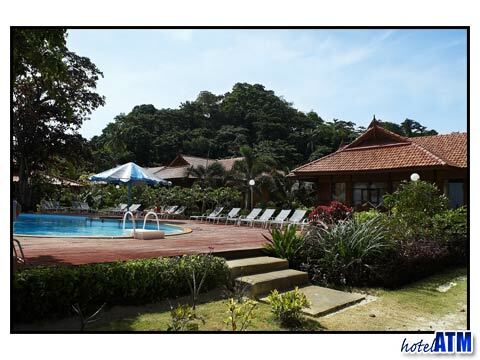 Beside of the fresh water swimming pool, we could see woody-flooring restaurant with the taste of Island Style, which serves authentic Thai foods, fresh food from the sea, and International dishes. To add a bit more spectacular experience, we have nightly entertainment show of Thai Classical Music Instrument played on the stage adjacent to restaurant. The PP Erawan Palms Resort features in our Top 10 hand-picked hotels of the Best 3 Star hotels on Phi Phi Island. 5/5 seaside resort with prestine beaches!